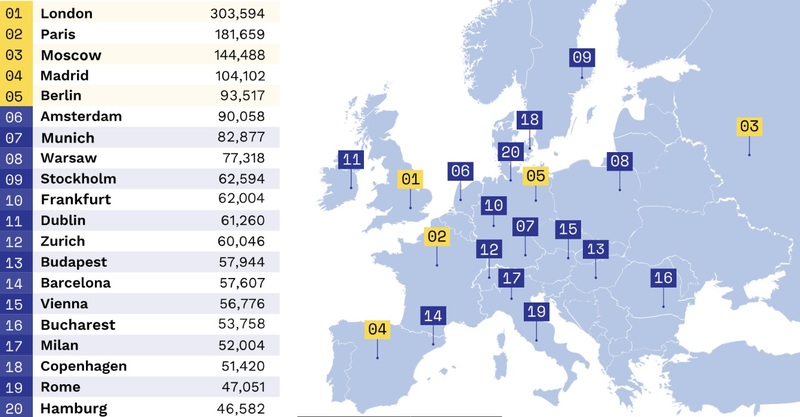 Bucharest is the 16th largest IT hub in Europe as it hosts around 53,700 professional developers, according to CEE The Resourceful Region report released by CESAwards. In the Central and Eastern European region, Bucharest is considered the 4th IT hub, after Warsaw, Budapest, and Vienna. “With over 800,000 developers, the region has as much tech talent as Germany or the UK, more than France and Spain combined, and over twice as much as Russia. According to London-based investment firm Atomico’s The State of European Tech report, four of the region’s capitals—Warsaw, Budapest, Vienna and Bucharest—are among Europe’s top 20 tech hubs when it comes to the number of professional developers,” the report said. No wonder, then, that availability of talent is one of the bright spots for start-ups in CEE. With software startups spending as much as 70-80 percent of their budget on payroll, CEE’s comparative advantage when it comes to living costs and salaries can go a long way in extending the region’s start-ups’ runway, the report indicates. The post Bucharest considered Europe’s 6th largest IT hub, with more than 53,000 professional developers appeared first on Business Review.